Samsung has always been a competition to every single wireless communication device manufacturers including Apple with their constant introduction of many superb replacement devices at considerably cheaper prices. This South Korean giant has always given a stiff rivalry to all the other brands in the wireless world. Whether it’s Samsung Galaxy S3 against iPhone 4S or even Galaxy Tab against other Android tablet in the market, Samsung has always given a tougher competition. Continuing this reputation, now this giant wireless manufacturer has unveiled its next hybrid to sweep over the Windows phone market which is now mostly dominated by Nokia and HTC Smartphones. They unveiled their new Samsung ATIV S, world’s first Windows 8 powered smartphone at the special Unpacked event at IFA on Wednesday. Although the pricing and availability to the market has not been announced yet but the features of this new Windows 8 phone is worth noticing. Samsung ATIV S features a 1.5 GHz Dual core Qualcomm processor along with a 8 Mega Pixel camera at the rear and a 1.9 Mega Pixel front facing camera. It carries a dimension of 137.2 x 70.5 x 8.7 mm and weight of 135 grams. This Windows 8 device also features a 4.8 inch Super AMOLED HD display which is protected with Corning Gorilla Glass 2. To add to this, ATIV S also has a powerful 2300 mAh battery which is claimed to deliver a high battery life by the company. The latest handset also features 1 GB RAM along with the internal storage capacity of 16-32 GB and all this is incorporated in a package of just 8.7 mm thickness. ATIV S also supports a number of features including GPS, A-GPS, Glonass – which is a radio based satellite navigation system, Bluetooth 3.0, USB 2.0. Along with this mouth watering stuff it also has Wi-Fi connectivity option, Proximity Sensor, Gyroscope, Accelerometer and many more stuff. 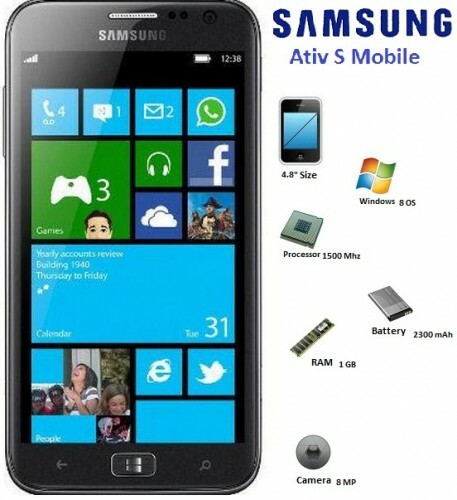 After successfully making its presence in the tough Android handset market, it is assumed by the analysts that the launch of the ATIV S by Samsung is very soon to take over the Windows 8 phone market as well. nice review, One of the giant company and the best phone provider the Samsung is now used a windows OS for their phone.